Brand Licensing Compare To Traditional Growth Strategies? Many perceive the concept of growth as something that is a very straightforward. However, there are a multitude of factors that need to be taken into consideration when developing a growth strategy for your company and brand. One aspect of growth that some tend to overlook when trying to expand is strong partnerships. Through partnerships, your company can team up with other powerful and driven companies to achieve that common goal of growth and recognition. Brand licensing is exactly that, a powerful partnership, an exceptionally viable growth strategy when done thoughtfully and with the right partners. But how does it stack up against other traditional growth strategies? Today the pressure to grow is unrelenting. Decision-makers seek it. Investors insist on it. Customers are buoyed by it. A growing company exudes confidence, prestige, and acceptance. People want to work for companies that they feel are going places, literally and figuratively. In part, that’s psychological. But, as McKinsey’s research shows, it’s also because there seems to be no alternative. Companies that are not growing are declining. Companies fail to even come close to realizing the full potential in their core business. Companies diversify too far in pursuit of fast growth. Companies fail to redefine their core successfully, meaning they quietly rot. Nevertheless, it is imperative to carefully think about a growth strategy, and which direction to take, in order to grow in a manner that is appropriate for your business. Even if you have been growing, there’s little to guarantee that the momentum you’ve worked so hard to build will continue to impel you forward. In my guide, Brand Licensing Versus Traditional Growth Strategies I show you how McKinsey, the worldwide management consulting firm, examined the top performers on the S&P Index concluded that most company growth has a predisposition to decline, even over a period of just three decades. Companies that are not planning for sustained growth over longer time frames (rather than quarter by quarter) are likely to find themselves under increasing downward pressure. Where Does The Majority of Your Growth Come From? There’s another important finding from McKinsey’s work that you’ll find in my guide. Do you know how much a company’s growth can be attributed to market share acquisition from competitors? You don’t have to guess. You can just read it in my guide, Brand Licensing Versus Traditional Growth Strategies: An Executive’s Guide To Deciding What’s Right For Your Brand. Not only will you find amazing stats on growth you’ll also find this: Where the vast majority of growth springs from. Not available in bookstores. You can only find it here. Downloads as a pdf to computers, tablet and smartphones. Start reading IMMEDIATELY. What percent of managers believed their company would realize growth if they looked at opportunities beyond their core business in the next five years? What percent of managers believed their company their growth would come from refining what they currently focus upon? What percent of managers believed that divestment of a currently held activity that they now judged to be non-core would generate increases in share prices over the next five years? The numbers are right here. They’ll help you understand why so many brands turn to licensing for sustained growth. even if it has worked in the past. Brand growth is when a brand expands the core business into a new geographic region or further saturates an existing region. It continues the business the brand is already in, offering more of the same to new audiences in different locales. It may do this as a self-contained business or through a franchise model. 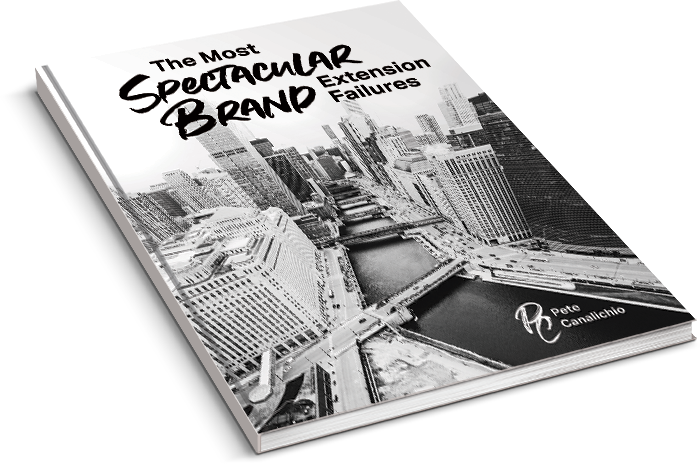 Brand Extension, also known as line extension, is about building out a brand product portfolio. This happens when the brand offers its consumers access to more of the same, only different. It’s about continuation. A whisky company extends its brand when it introduces a new line of malt or adds another style of whisky to its current portfolio or how cereals are now formulated to meet a range of perceived needs such as gluten-free, low cholesterol, with premium ingredients, organic, etc. An entertaining romp through the Don’t-Let-This-Happen-To-You Brand Licensing Cemetery. From Colgate’s entry into frozen foods to Ferrari’s attempt to market a purse you’ll come away with a strong sense of WHAT NOT TO DO WITH YOUR BRAND. Brands that are looking to expand are best to look for a beachhead opportunity in a large category, creating scale for themselves. But, simply identifying that large market is not enough. A brand should only enter that market if they have fit or “permission” from consumers or “fit” with where consumers expect to see them. Tauber and Parham add, a brand should only exercise that fit if it can do so with leverage, whereby the brand can use its good name and attributes to achieve a competitive advantage. There’s an inverse relationship between fit (consumer permission) and leverage (competitive advantage). Consumers might give a brand permission to be in many categories. However, if they don’t perceive the new products as credible and superior to existing competitive products, it’s a bad business decision. Brand expansion, which is also known as category extension, could be perceived as even more riskier. Here, brands broaden their presence into markets where they have not built their reputation and, often, they rely on licensees to fill the experience and capacity gap on their behalf. Brands should look to expand into sectors where they will have a specific advantage because of how consumers perceive them. That expansion may be obvious in some underserved markets, or it may appear completely out of left field. Success will depend on whether consumers “follow” the leap. And, on knowing, that comes down to a deep and proven understanding of how consumers see a brand in their lives. It’s one thing to know that you should expand. Just as important is knowing where to expand. Every brand that is looking to go beyond what it is currently known for, regardless of the mechanism it intends to use, needs an expansion point — a pivotal characteristic that translates powerfully from one product variant to another, or from one sector to another, to give consumers even more of what they want from the brand. In my guide, Brand Licensing Versus Traditional Growth Strategies: An Executive’s Guide To Deciding What’s Right For Your Brand. I show you multiple examples of how companies arrived at their expansion point–like Ferrari’s Theme Park. The brand owners can choose either to make or source the product or service in the new chosen category themselves. They can extend via a third party. If they choose to use a third party, they can either acquire a company that makes the product or provides the service, or they can license their brand to a company to make, market and sell. When we frame growth in this manner there are five ways for brand owners to hit their growth targets. 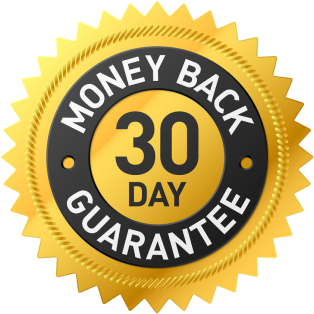 Stay in the markets they know and build out new products and services to win market share. Merge or acquire (or be merged or acquired by) another company meaning they can take over someone else and pay, in cash, shares, or both, to gain a bigger footprint and a higher profile, providing that they can then gain the efficiencies to make the investment work. Click here to see three more ways brand owners can hit their growth targets. How quickly is the sector growing? And what are the predicted growth patterns over the next five years? How long are the economic cycles in the sector? How tightly does the sector typically mirror changes in the wider economy? In other words, are economic cycles heavily influenced by consumer and market confidence or are they more consistent? What types of brands do best in the sector — luxury or budget, for example — and is there direct alignment between your brand positioning and the positioning of those that thrive in the lateral sector? Click here to see more questions brand owners can ask themselves to help decide where to expand. Striking the right balance between the four elements of a successful extension: Involvement, leadership, coherence, and enhancement. The 10 powerful consumer motivations you should take into consideration when planning a growth strategy: Familiarity, momentum, immediacy and more. Examples of obvious licensing examples (NFL apparel, Star Wars figurines) and not-so-obvious ( Rubbermaid branded closet storage, Mr. Clean cleaning buckets). Growth benefits of licensing–with numbers backed by industry studies and polls. 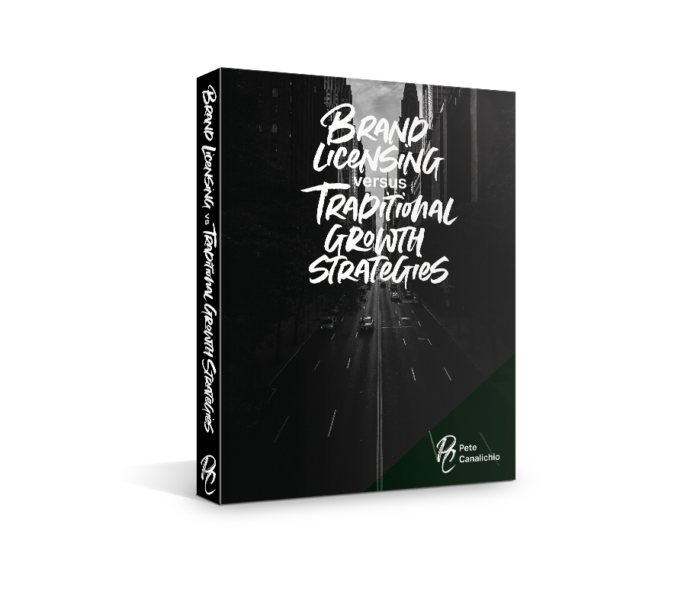 A vetted 5-factor framework that will help you decide whether your brand is a candidate for successful licensing. My proven 4-step method for selecting categories for licensing. How to avoid brand over-extensions that confuse customers and damage the core brand. The brand licensing process for the licensor. Success stories of brand growth through licensing. Copyright © 2019. Pete Canalichio. All Rights Reserved.